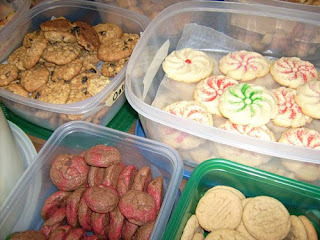 The cookie baking is nearly done for the season. As promised I wanted to share some photos and numbers with you. We laid everything out on the table last night, so I could pack some gifts for friends and coworkers. It filled the entire table as you can see below. I won't list, or rather can't list every type of cookie because I was only responsible for 4 different kinds and honestly I think there are nearly 20 varieties. 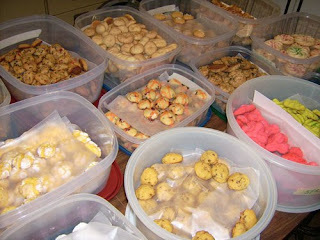 As to the grand total of cookies...2243, which means nearly 187 dozen. I told you we were Santa's bakery. That is amazing, apart from a bakery I dont know anyone whos baked quite as much! What an accomplishment!